Motor Yacht CHIARABI’ is an Azimut 62 Evolution launched in 2008. 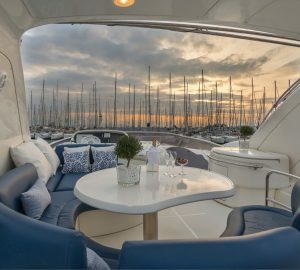 She combines high performance cruising of 27 – 33 knots with a comfortable and elegant interior and efficient layout with high quality materials such as teak, stainless steel and crystal. CHIARABI’ is in pristine condition and is based in Marina Punta Faro, Lignano Sabbiadoro (UD), Italy, the perfect starting point in order to visit the enchanting lagoon of Venice, the Northern Adriatic Sea, from Trieste to Croatia, and Greece. Her Saloon (on two levels), galley and cabins are elegant, comfortable and fully equipped. CHIARABI’ offers formal dining inside and an al fresco dining option. CHIARABI ‘s Flying Bridge and cockpit are provided with sofas, tables, sundeck and cushions; the bow has sunbathing area with cushions and a stainless steel and teak retractable swimming ladder. This is the perfect spot to relax and take in the enchanting panoramic Mediterranean view. Motor Yacht CHIARABI offers comfortable and elegant accommodation for 6 guests in 3 cabins. The master cabin and the VIP cabin each have en-suite bathroom (sink, storage cabinets, shower, bidet) and a 17’’ TV. The twin cabin has an en-suite bathroom (sink, shower and bidet). The Azimut 62 Evolution CHIARABI has a 37’’ plasma TV, DVD player, CD player, radio, Dolby Surround Sound and Sky TV in the saloon. The galley and the utility room are equipped with microwave oven, refrigerator, freezer, ice-maker, dishwasher, washing machine and tumble dryer. The master cabin and the VIP cabin have 17’’ TV and en-suite bathrooms.